On Friday, Shelly and I spent the afternoon painting the exterior of the House. We are painting the trim on the garage and the back of the House. We got all the back windows. both ground level and 2nd story. I have never liked climbing that high to paint and do things. The trim looks good so now we will have to paint the main sections and get a fresh coat on the rest of the house. The painting along with helping a friend move, and trying to straighten the house has worn us out. Hopefully we can recoup and be ready for the following week. The Insane Month of September!!!!! And I thought that August was busy. We have had something going on every night this month and it just has not let up. We had fun participating in the Road Show for our church. The theme was old TV shows and we did the Andy Griffith Show. We all had so much fun with that. I am taking classes to get my amateur radio license or HAM license. The test is next month. The classes are free and the test will cost $14. This is something that I have always wanted to do and will finally accomplish it. We finally sold our old van on Monday night. That is a relief and the money will go to offset the money spent on the new van. Our little Joy continues to grow. She is starting to talk to us and really spends time watching us. She sleeps through the night which is a God send as all the other girls took 11 months before they did that. We are in the last week of September and I don't know where it has gone. It has been so busy. 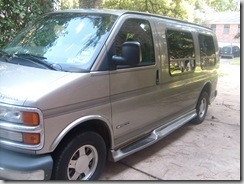 About two weeks ago we bought a new van for the Turpin Family! 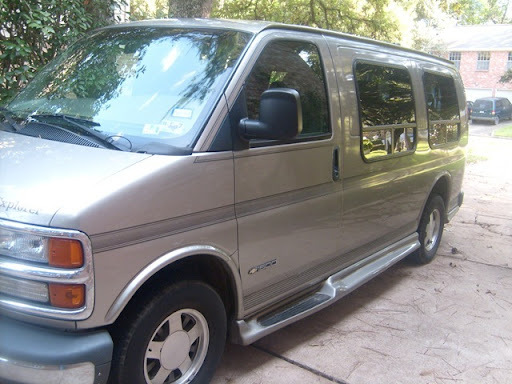 it is a Chevrolet Express and is really nice. Now we just have to sell the old van and get through to the end of the year.